Krewe of Thoth, named for the Egyptian god of wisdom. He is the inventor of science, art and letters. The god Thoth is traditionally represented by the body of a man and the head of an ibis. His mythological counterparts were the Greek Hermes and the Roman Mercury. The Krewe of Thoth was organized in 1947 in the uptown neighborhood. It presented its first ball and five-float parade with 50 members the next year. 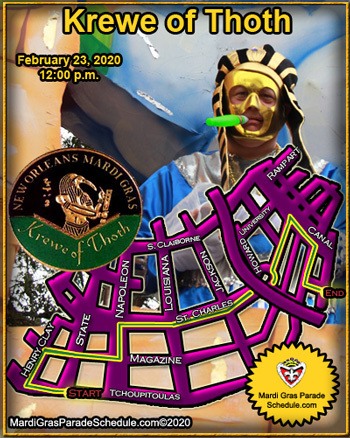 Because it designs its parade route to pass in front of 14 institutions that care for persons with disabilities and illnesses, the men of Thoth have become known as the "Krewe of the Shut Ins".